Brief summary of the paper: The Chestnut-banded Plover Charadrius pallidus is a Near-Threatened shorebird species endemic to mainland Africa. We examined levels of genetic differentiation between its two morphologically and geographically distinct subspecies, C. p. pallidus in southern Africa (population size 11 000–16 000) and C. p. venustus in eastern Africa (population size 6500). 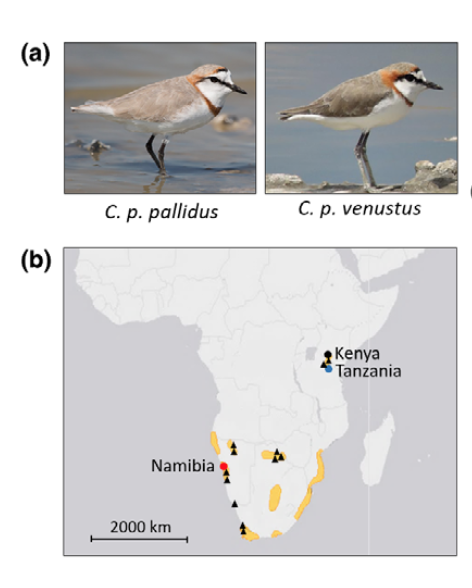 In contrast to other plover species that maintain genetic connectivity over thousands of kilometres across continental Africa, we found profound genetic differences between remote sampling sites. Phylogenetic network analysis based on four nuclear and two mitochondrial gene regions, and population genetic structure analyses based on 11 microsatellite loci, indicated strong genetic divergence, with 2.36% mitochondrial sequence divergence between individuals sampled in Namibia (southern Africa) and those of Kenya and Tanzania (eastern Africa). This distinction between southern and eastern African populations was also supported by highly distinct genetic clusters based on microsatellite markers (global FST = 0.309, = 0.510, D = 0.182). Behavioural factors that may promote genetic differentiation in this species include habitat specialization, monogamous mating behaviour and sedentariness. Reliance on an extremely small number of saline lakes for breeding and limited dispersal between populations are likely to promote reproductive and genetic isolation between eastern and southern Africa. We suggest that the two Chestnut-banded Plover subspecies may warrant elevation to full species status. To assess this distinction fully, additional sample collection will be needed, with analysis of genetic and phenotypic traits from across the species’ entire breeding range.